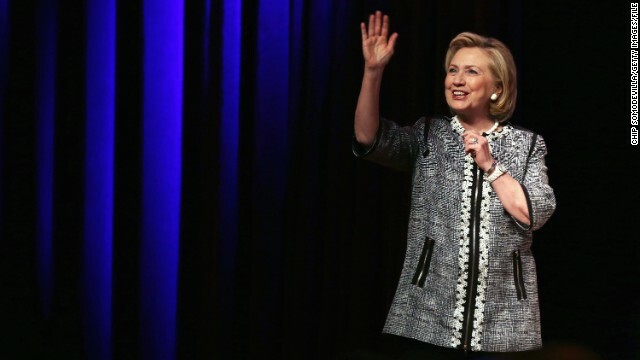 Washington (CNN) – Just like anyone thinking about applying for a new position, Hillary Clinton – or people close to her – have tinkered with and beefed up the promotional biography she uses at different events. Since leaving the State Department in 2013, Clinton's speaking agency provided organizations before which she was appearing with a variation of the lengthy bio that she uses at the Bill, Hillary and Chelsea Clinton Foundation. The organization would, in turn, use some or all of the bio in promotional and press materials. "The bio we used came directly from the Harry Walker agency," said an organizer of a past Clinton event who didn't want to be identified. "It was verbatim and they insist on that as part of the agreement. It is in her contract." But recently, Clinton has dispensed with her old bio and gone with a shorter description that emphasizes her new memoir and work as secretary of state, including specific highlights from her four years as America's top diplomat. A Clinton spokesman tells CNN that the bio was updated for Clinton's new memoir and subsequent book tour. The bio now, however, reads much like the same pitch Clinton has given for why her four years at State were a success and why she would possibly succeed as president. Clinton undertook efforts "to restore America's leadership after eight years in which it was badly eroded," states the bio, an apparent swipe at former President George W. Bush. During her nearly two month book tour around her memoir "Hard Choices," Clinton has been asked repeatedly what her major accomplishments were at State. In an answer that now mimics her bio, Clinton told NPR in June that "the most important thing I did was to help restore America's leadership around the world. ... We were flat on our back when I walked in there the first time." These efforts, according to the bio, included "repairing our fraying alliances to negotiating a cease-fire in Gaza that defended Israel's security and headed off another war in the Middle East," "mobilizing an international coalition to impose crippling sanctions against Iran" and "standing up to China and helping reassert the United States as a Pacific power." "Thanks in large measure to Hillary's leadership, people were finally able to say: America's back," reads the bio. "She championed human rights, internet freedom, religious freedom, and rights and opportunities for women and girls, LGBT people, and young people around the world, as she has her entire career." The bio also emphasizes economic actions Clinton took, stating that the former secretary of state "went to bat for American workers and companies around the world to boost exports, create jobs back home, and level the playing field against unfair competition from China and elsewhere." This is a noticeable departure from Clinton's old bio, which highlighted Clinton's lengthy history in public life, including eight years as first lady of the United States and eight years as the United States senator from New York. While the old bio mentions Clinton's time as secretary of state – "In her four years as Secretary of State, Clinton played a central role in restoring America's standing in the world and strengthening its global leadership," states to bio – it lacks the specificity that the new bio includes. Examples of Clinton's new bio began to crop up around events the former secretary of state will attend this fall. For four upcoming events – an August 28 tech keynote in San Francisco, a September 15 medical keynote in Washington, DC, an October 8 medical keynote in Chicago and a December 4 women's event keynote in Boston – Clinton used the new bio. In most of her previous speeches – for example, her March speech at the University of California Los Angeles, her April speech at the University of Connecticut and her February speech at the University of Miami – Clinton used a version of her older bio. I understand there are soon to be booko jobs opening in soup kitchens. You will have to speak Spanish. I say the leftist Mrs Clintons resume looks bad and packed full of blunders and missteps and she needs a a new reset button also that old one dont work no more its just to old . Yes, on Hillary16, first America's woman president. She lies about damn near everything...why should her resume be any different? Clinton's bio is largely an inflated bunch of nonsense. @ gurgy we need a president . A strong leader not a bobble head like we got now . And thats all Clinton is just more of the same thing woman or not . We don't need a vegan with a temper riding shotgun in the White House ! Hillary in the white house would be the biggest mistake the American people could make. Though Obama would be happy about it. She would make him look good. Just as Carter is happy with Obama making him look good, or at least not so bad. Interesting. Politicians are no doubt doing this kind of thing all the time...across the board...and yet HRC is the first time the MSM decided to tee it up for the GOP/Teatrolls to throw poop at it. Now that we have been better protected from terrorists, the economy is on the rebound, jobless numbers are looking better, no new wars, less US soldiers dead, less uninsured people we need to keep progressive by moving forward. Go Clinton or maybe Warren.Being part of the civilized world is a good thing. -that bobble head was BushW, Reagan, definitely not Obama. At least he signed ACA Law, now you have health insurance. O.k. Is the former national security adviser Samuel "Sandy" Berger still around? Looks like he may have to take more secret documents from the National Archives given the rewrites; fabrication; lying, flip-flopping, double-talking from the former secretary of state Hillary Clinton. She better remove that Secretary of State nonsense from her Bio while she's at it. She'd be better off not publicizing the fact that she set the Middle East up for the current mess they find themselves in. Also, Benghazi should be buried deep since she feels it doesn't make a difference. The Russia Reset......ah, the Russia Reset. What a great job.......... NOT! Did I miss the story about the GDP running above 4% for the 2nd quarter of this year? – The Tea Party takes over the House, which is followed by a lowering of America's credit rating in 2011 and a costly government shutdown in 2013. – George W. Bush is elected in 2000. He begins an ideologically driven campaign of deregulation and tax cuts that enrich big business and big investors, while destroying 8 million manufacturing jobs in the process. His reign of error ended with the Great Recession, which Republicans didn't want to do anything about, not at all. They wanted to watch Rome burn. – Newt Gingrich and company took over the House under Pres. Bill Clinton. Newt elevated and redefined the art of political obstruction and negative talking points to new levels, which have long since been surpassed under Pres. Obama. Oh, yeah. Newt Gingrich oversaw what was at that point the largest government shutdown in history. – George H.W. Bush. While he is famed for referring to "trickle down economics" as "voodoo economics", he still pushed for "read my lips, no new taxes" and deregulation. The Savings and Loan Crisis that led to a severe recession was entirely the result of regulators not doing their jobs, and politicians accepting bribes to not do theirs. – Ronald Reagan enacted the largest tax cuts in U.S. history, which ignited the expected "boom then bust" cycle that we have always seen with supply side tax policies. Reagan tax cut his way into two self-inflicted recessions, which forced him to undo some of his cuts by raising taxes. Reagan also spent like money we didn't have. During his tenure, we saw the annual budget deficit increase by a factor of ten, and the national debt more than tripled. Are you starting to see a pattern here? Republicans are really bad for the U.S. economy.